When you walk into a room and see a device attached to the wall, it’s natural to wonder about its function and purpose. So how do air purifiers work? And what separates the best of the best? For starters, there are several different methods purifiers can use to clean the air, including ionizers, ultraviolet light and filtration. The best air purifiers, whether personal or commercial, will efficiently remove contaminants from the air, minimize energy consumption, maintain a safe noise level and integrate seamlessly into any environment. We prefer true HEPA filter technology complemented by a pre-filter to remove large particles such as dust and a carbon filter to remove odors and volatile organic compounds (VOCs). True HEPA filters must meet rigorous standards set out by the U.S. Department of Energy, such as removing 99.97 percent of particles that are 0.3 microns. If you see language such as “HEPA-like” or “Euro HEPA,” know that it’s misleading language for purifiers that don’t meet the standard. AeraMax Professional works by drawing polluted air in and filtering out more than 99 percent of contaminants, including dust, mold spores, germs, VOCs, odors and allergens. After the air is filtered, it is ionized and recirculated back into a room. When complemented with good ventilation and minimize contamination from harmful sources by removing hazardous building materials such as cleaning products, air purifiers help ensure clean and healthy environments for building occupants. Of course, efficient energy usage, worker productivity and aesthetic design are integral to a truly well-functioning air purifier. 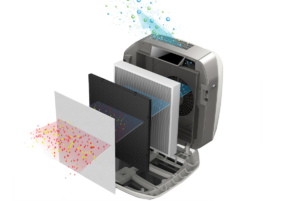 With AeraMax Professional, we developed patented EnviroSmart™ Technology so that the device can sense a room’s air quality and occupancy. This allows AeraMax Professional to adjust to a room’s condition, optimizing performance, saving energy, and extending filter life. What’s more, our quiet mode setting regulates the machine so as to not disrupt meetings. Other than an occasional filter change, this makes commercial grade air purifiers a targeted solution to providing cleaner facilities by improving indoor air where it’s needed most, such as offices, schools and residential facilities.